Now that you know what you need to get to Cuba, here is your travel guide to this beautiful island which transcends time. If you're a baller on a budget then you'll love Cuba. It's not expensive when you compare it to other popular travel destinations. Finding an affordable place to is easy, especial if you're splitting the cost. Now, I am usually all about hostel life when traveling, but in Cuba, that just wasn't happening. Instead, I used Airbnb like most people who travel here. In our group, there were four of us and we stayed here in central Havanna. Our host, Esperanza, was the sweetest. She and her husband were very accommodating, and they helped us find transportation and a few tours while there. We stayed upstairs in a private apartment above their home. There were two rooms, each with a private bathroom and a shared kitchen. She also cooked breakfast for us each morning for 5 CUC a person per day. Most hosts offer this option and it is worth it. We got tons of food and didn't have to go searching for a place to eat each morning. Also, her french toast was delicious. The apartment is walking distance to Old Havana and the Malecon. Highly recommend staying at Casa Particular. There was so much to do in Cuba we were exhausted by the end of each day. If you're looking for some authentic Cuban goodies to take back home then make your way to Obispo street. As you walk down you'll find Obispo Market off to the side. Walk through the gate and make your way down the narrow rows as you shop for handmade bags and pottery. The market is not as expensive as some of the other stores on the main street, so it is a good place to stock up on gifts for back home. When you get to the end of Obispo stop in one of the restaurants for a fresh juice and cool off. Did you even go to Cuba if you didn't stop here? Yes, if you went you went, but you should stop at Floridita's too. It's made famous by Hemmingway but the live music and Old Havana aesthetic hold their own. It is always crowded in there so be prepared to wait before getting a table. Don't forget to snap that Insta picture out front before you go. Old Havana is full of people, restaurants, shops, museums- everything. Spend a morning to walk around and take it all in. Being in Cuba is like going back in time and you see it in every alley and courtyard you walk through. While walking around we found a carriage ride and decided to take a tour. We saw way more of Old and Central Havana than if we would have walked. Plus the breeze was nice. Did I mention it was hot? 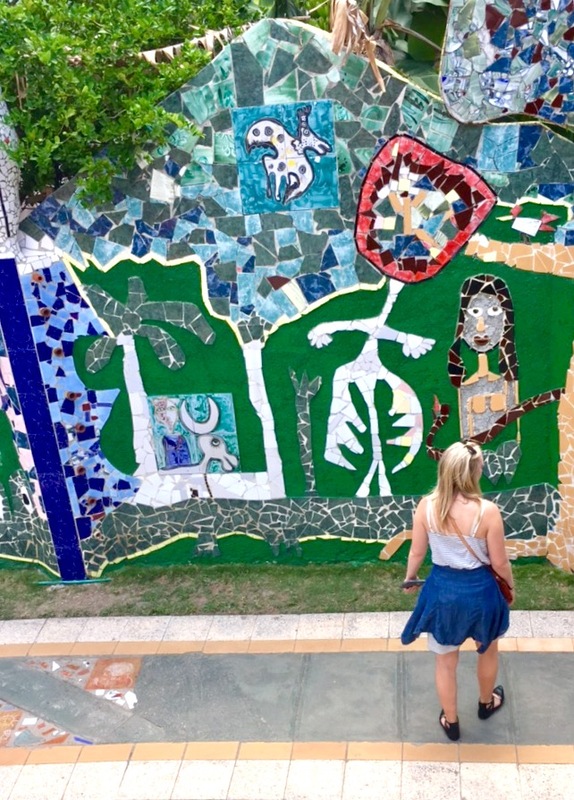 Fusterlandia is a mosaic tile park outside of the city center. Think Park Guell in Spain, but much smaller. 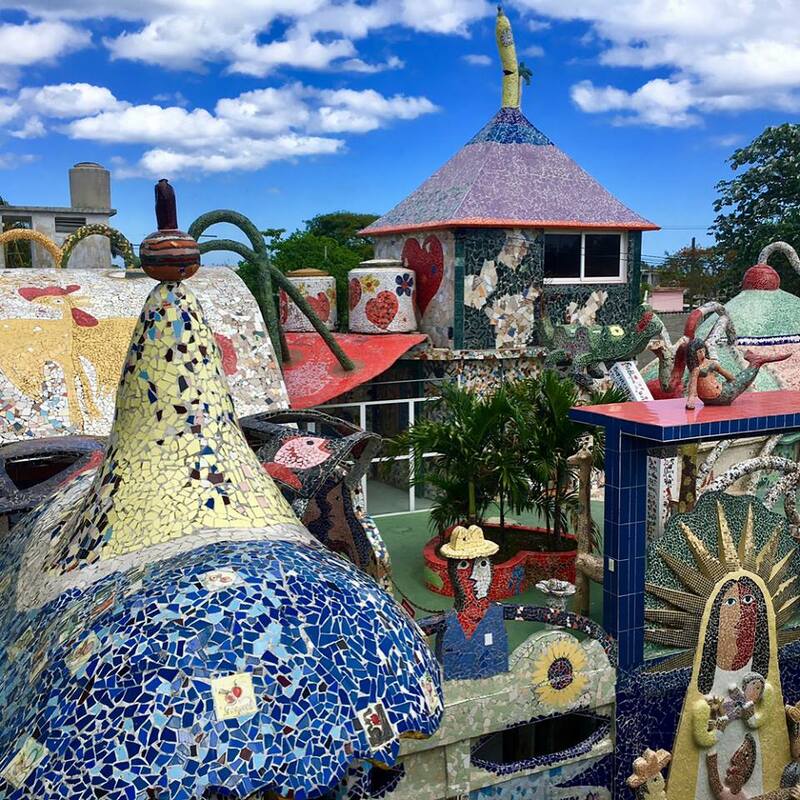 It was designed by Jose Fuster who built the park around his own home, and it is an ongoing project still today. The designs and murals are amazing, and mosaic tile covers every surface you see. I like getting out of the city when I travel places, so this was a nice break. You can taxi there and spend a few hours looking around and shopping. There's no fee to get into the park, and a taxi should cost $20 CUC from Havana. This is my favorite thing to buy when traveling! I don't want keychains or magnets. I want great art from local artist. I'm convinced one day I'll have an amazing gallery from all my travels. Cuba is known for its art scene. Almost every street is filled with places you can buy paintings. A lot of it was a bit too cheesy/touristy (is that a word) for me. Then there were others that were just too dark. Towards the end of the trip, I eventually found an amazing piece I fell in love with. Unless you absolutely love it, don't buy the first few pieces you see. Now this one is a bit random. During our trip, my grandmother kept insisting she wanted to find this vanilla ice cream. "I want real vanilla." Finally, we found a pint of Nestle Linea Azul vanilla ice cream our last night in Havana. We bought it at some random corner store, but WOW was it good. If you come across this, buy it, and eat it every day you're there!! Vinales is beautiful, and such a contrast to what you see in Central Havana. Cuba's countryside should not be missed, and if you're in Vinales go and visit a tobacco farm. There are plenty of tours you can take and many offer horseback riding if that's your thing. If you're looking to bring back Cuban cigars that's where you should buy them from. Depending on how many you bring back you don't have to buy them at the airport or in Havana. There are also several cave tours available. You should either book those while you're still stateside, or see if your host can do it for you once you get to Cuba. Our host booked ours. My favorite part about Vinales was the food (are you surprised?). The food in the city was not what we were expecting. I know, surprising. It's Cuba! Cuban food is amazing! Yes, it is amazing and flavorful stateside, however, in Havana not so much. The people there stretch and save everything they have. This includes seasonings and produce. In the country, produce is readily available and the food is much better. On our final day, we ate at this small restaurant on top of a hill with a view. It was a wonderful ending to our trip as we ate with new friends we met there. It was like that scene from Under the Tuscan Sun. The one where she eats lunch with that guy's family and discovers limoncello for the first time (you know what I'm talking about?). Well, my limoncello was pumpkin flan. Talk about incredible. If you come across pumpkin flan in Cuba, get ready to be blessed. Now hit up Kayak and pack your bags! Havana oh nah nah.